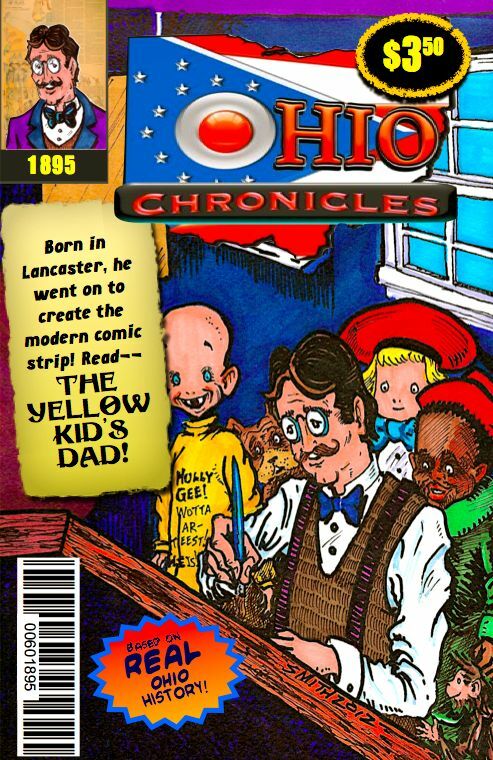 There were a lot of creators at SPACE that I hadn't heard of before, but one of them that particularly caught my eye was Lee Smith, who does mini-comics covering various aspects of Ohio history. 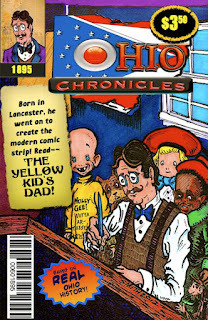 The concept isn't new -- Jim Baker began working on Ben Hardy & the Ohio Adventure back in 1952 -- but comics that are geared specifically towards education are surprisingly few. Whereas Baker tried covering the settlement of the Ohio Valley and the region's path to statehood, Smith tackles a variety of "smaller" subjects. Very specific individuals or events, relevant to the state as a whole. President Taft's re-election run. The Land Ordinance of 1785. The Millfield Mine Disaster. That kind of thing. He goes a step further in that, with his teacher's background, he also makes teachers' guides available for each book as well, so that educators don't have to develop their own materials from scratch to make these comics useful in the classroom. He also makes a point of not white-washing history, providing biographies of several Black and Native American people as well as not excluding the additional hardships thrust upon them by white settlers. The books are only sixteen pages each, so they clearly don't have room to go into great detail, but Smith's intent is, I think, just to provide a high level overview that's engaging enough to encourage people to read more on their own. To pique a reader's interest enough to get them interested in the topic, and show that history is more than a string of names and dates that we're so often taught in school. The illustrations are cartoony, which helps to make the subjects more approachable, and the shortness means that reading them doesn't require much of a time commitment.